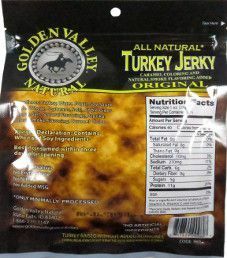 Since 1968, Golden Valley Natural has been a leading producer of natural and organic meat snacks in the United States. Golden Valley Natural is located in Idaho Falls, Idaho. The livestock used is advertised to be ethically ranch raised, where the animals have free range access to green pastures, the way nature intended. This jerky is manufactured at USDA plants in Idaho Falls, Idaho. There is currently a plant under construction in Shelley, Idaho, which is nearing completion. As a general rule, turkey is considered to be healthier compared to beef because turkey is low in fat content. These turkey are ethically raised with no growth hormones, or additional antibiotics given. They also have some free range to roam about. The liquid marinade consists of soy sauce, water, and very healthy apple cider vinegar. The sugar level is somewhat on the high side at 5 grams of sugar per 28 grams of jerky. Our preference is 3 grams of sugar or less. The salt level is respectable at 280mg of salt per 28 grams of jerky. As advertised, this jerky has no sodium nitrite added. Instead, primarily just salt is the main preservative used, and apple cider vinegar to a lesser degree. Admirably, this jerky qualifies to have no MSG added. These slices of turkey are medium in size. They admirably have a uniformly medium thickness. The texture is near soft and tender, but not quite. 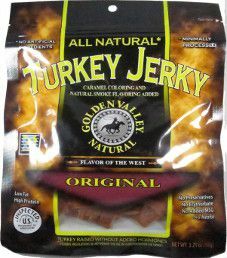 Chewing this turkey jerky is relatively easy. 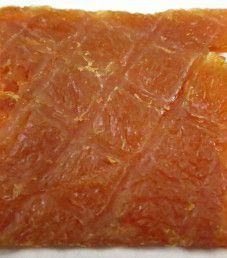 There are no signs of fat, and there is no oily residue left on your fingers while handling these jerky strips. The first taste detected is the natural turkey flavor, the way it should be for an original flavor. For whatever reason, this turkey seems to taste better than other brands we have reviewed. There is a mild tang from the apple cider vinegar. You could say both the sugar and salt are at mild levels. In the background, there is a light smoked taste. Overall, this is a very pleasant blend of flavors. This 3.25 ounce/92 gram bag of jerky sells online for $6.59. That works out to $2.03 an ounce, which rates as an average price. As an added bonus, there is currently free shipping on orders over $35. 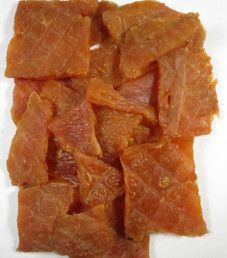 This is the type of jerky that kids would absolutely love, being mild flavored. This is a standard resealable plastic bag. Everything is imprinted directly on the bag, and there are no labels affixed. The background of the bag is interesting, with what looks like some woven fabric. 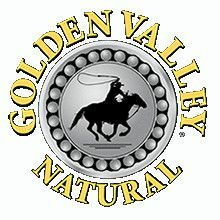 The Golden Valley Natural logo is a cowboy with a lasso riding a horse. Their slogan is “Flavor of the West”. Facts displayed on this bag are “No Artificial Ingredients”, “High Protein”, “Minimally Processed”, “Low Fat”, “Natural Smoke Flavoring Added”, “No Preservatives”, “No Erythorbate”, “No Added MSG”, “No Nitrite”, and “Turkey Raised Without Added Hormones and Without Antibiotics”. All bag categories are covered except one. There is no blurb printed about Golden Valley Natural, or this flavor. To the credit of Golden Valley Natural, they provide a toll free phone number for customer inquiries.